Today, I am going to review Zandu's another product i.e. Zandu Vigorex. It is a product by Zandu to provide you energy and stamina whenever you feel low. I do take it a few times when I was tired and now I am available with its review. In the today's environment, it has become a culture to depend more on such product to get relief from tiredness. Many such products are very successful in many markets because many people feel tired due to present hectic lifestyle. All these products make very tall claims and asks us to take them regularly. However, we don't know that long term dependence on these products may be harmful for our body; though, we can take them sometimes when we are feeling low in energy. I mostly come across these products because of my father's habit of buying all such items which get advertised on TV. He is a long term Blood sugar and heart patient; therefore, he often feels low energy. 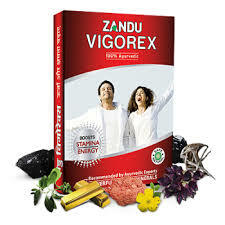 On one hectic day, I was feeling very tired and therefore, I decided to give try to Zandu Vigorex which was available at our home. I took one capsule of Zandu Vigorex and then relaxed for some time. After two hours, I felt some relief, but it was not something very extraordinary. In the next few days, I took it regularly with one capsule daily during some of hectic days. I felt some relief, but it was almost same like the much cheaper multivitamin you take. I will say, it is a nice product and it do work. However, I can't guarantee like Zandu Pancharishta that it will work for everyone. People can do give it a try; however, it will be wrong to depend too much on it or take excess dosage of it. Zandu recommends one capsule twice a day of Vigorex. At present company is selling a pack of 10 capsules at a price of Rs 170. The main ingredients of dry extracts of Mucuna pruriens, Asparagus, Tribulus, Withania, black asphaltum, Yasad Bhasma, Svarna Basma etc. Most of these ingredients are rich in essential vitamins and minerals; therefore, we can get most of essential natural vitamins and minerals with it. Zandu claims that it is a 100% natural product and safe for everyone; though, I will go with caution if you are suffering with any health problem. My rating for this product is 7 out of 10.